A professor of English at Endicott College and a Gloucester resident, Gordon brings a rousing zeal to her pages. Both Wollstonecraft and Shelley have been the subject of previous biographies — the author builds her account on a tremendous variety of sources and scholarship — but Gordon, alternating between the two chapter by chapter, binds their lives into a fascinating whole. She shows, in vivid detail, how mother influenced daughter, and how the daughter’s struggles mirrored the mother’s. Gordon can be a theatrically effusive writer. (“Who was the ideal woman? Mary [Wollstonecraft] asked. Was she a fainting maiden, easily fatigued and naïve? No! 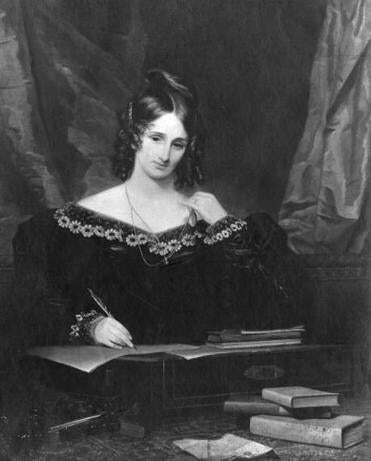 She was a resourceful intelligent human being.’’) But her style matches the outsized passion — Mary Shelley would declare her love to her husband on her mother’s grave — and intellectual ferment that define both women’s stories. Wollstonecraft’s life brims with drama. Born in 1759, she escaped the confines of her large family, becoming a governess. But she resisted this path, starting a school for girls, where she promoted ideas of independence for women. Hers was a daring pedagogy. She also started to write, finding a sympathetic publisher in London, Joseph Johnson, whose support was vital and enduring. She reported on events in France after the revolution, taking on Edmund Burke over the meanings of this watershed moment. 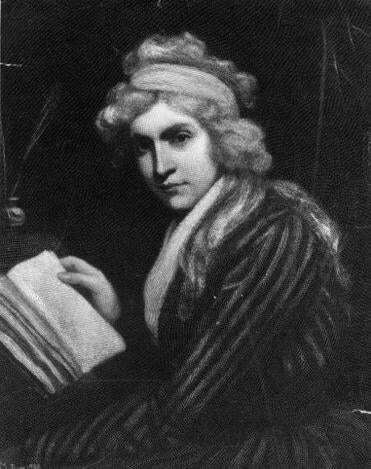 Mary Shelley’s father was philosopher William Godwin, whom the then-pregnant Wollstonecraft married in 1797. Mary Godwin, as she was then called, plunged into this milieu when she eloped with Shelley in 1814, her half-sister Claire in tow. It was a scandalous ménage, and an unstable one. The mercurial poet, an admirer of Godwin père, was notorious for his atheism and radical political views, and his flights of fancy would prove trying to Mary, as would his tumultuous friendship with Byron. Still, he was a fervid supporter of her work and encouraged her efforts with “Frankenstein.’’ Gordon reads this classic through the lens of loss, of a world bereft of mothers. It is, she suggests, a parable about the dangers of unchecked male power, the same power that Wollstonecraft battled in her life. Indeed, the problem of male power emerges as the troubling theme of this book. Neither Shelley or Wollstonecraft could fully escape it. After the latter’s death, Godwin tried to tame his wife’s legacy by downplaying her considerable achievements and criticizing “A Vindication.’’ In doing so he did lasting damage to her reputation. Both Byron and Shelley could treat women as playthings. Claire bore Byron an illegitimate daughter, but she grew to hate him, and Shelley, calling them “monsters of lying, meanness cruelty and treachery.” The measured Gordon never resorts to such epithets, but she never lets you forget the toll exacted on her subjects as they sought new worlds. Matthew Price is a regular contributor to the Globe. He can be reached at mprice68@gmail.com.